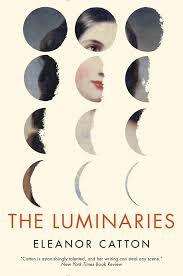 Because The Luminaries is fiction I think it’s legitimate (and fun) to use astrology in developing fictional characters as well as themes like fate, love and fortune, etc. In astrology (which I agree is fiction) Capricorns are “said to be” ambitious. Of course all real Capricorns aren’t ambitious – I never was particularly – but it’s a fairly good thing to be in our culture so I won’t totally disclaim it (typical). But I’m a real person with lots of characteristics. Gascoigne in the book is ambitious – he’s a Capricorn. Devlin, the chaplain is not ambitious, he’s more compassionate – as is befitting a Pisces. Balfour is a “typical” Sagittarius – independent, friendly. Zodiac Signs (http://zodiac-signs-astrology.com) has symbols which link to very brief attributes of that sign. I’m going to line them up and see if Catton developed her characters along those lines. I’m sure she did and added the info for our (and her) amusement). I think the theme of astrology adds tremendously to the book even if you ignore it. I was looking for evidence that Catton used the descriptors to fashion her characters – I wasn’t looking for complete agreement – only one or two distinct characteristics. – Diplomatic p. 120 etc. represents traders, attorneys and messengers. ** Lydia (Wells) Carver née Greenway: married to Wells and Carver and brothel owner? She represents artists, traders, and all occupations related to beauty and seduction. Mars – passion/action/impulse – anger/ rage-a-holic – virility, action, violence, courage and boldness. represents the military, sportsmen, warriors, surgeons, blacksmiths, etc. The 12 men in Chapter 1 agree Carver is a villain. Jupiter – good fortune ??? Jupiter represents people in power, magistrates, great professors, and religious figures. non-emotive, active, secondary, or sometimes, emotive, non-active, secondary. He is a phlegmatic, sentimental or apathetic. emotive, non-active, primary, or non-emotive, non-active and primary. She is nervous, or amorphous. “Imum Coeli “ The Imum Coeli is said to refer to our roots and also to the least conscious part of ourselves. It symbolizes foundations, beginnings in life, what may have been experienced through parental inheritance and homeland influences, need for security and relationships with the home and family life. It also may describe the circumstances that we will encounter at the end of our lives. Because this house was the most distant point possible from the visible part of the horoscope, Hellenistic astrologers considered the IC to be the home of the underworld, or Hades. The Node is a calculation of the Moon. The South Node shows where you have been (in Soul terms), and the North Node shows where you are going (why you are here). The occult stuff, seances and ghostly incidents, was pure fun but never believable – not for me. I suppose it makes the book a kind of post-modern Victorian Gothic? Only instead of deteriorated mansions we have a gold-rush town. Fwiw, seances were very popular in the mid to late 19th century – also astrology was coming into its own again following the clamping down during the Reformation/Inquisition eras. *** I think this is the reason that Emory was hit by the bullet and that Anna used Emory’s hand to write his name. 1£ (BPS) in Dickens day was worth about £44 today and £44 is equal to $70.80 US. 1 shilling given in 1860 or so would be about $2.20 today. Moody’s 10 shillings to the maid is like $22. Land was about 10 shillings an acre – $22. Prospector’s license was £44. Balfour’s shilling to Tauwhare is like a couple bucks. Anna’s bail was 1£ 1 shilling – $72. Her rent was 10 shillings a week – $22. She owes 3 months so that’s £6 or $264 (very cheap rent!). I’m not sure what the cocaine cost.